The climax of the film is staged at the father’s house. The separation of the father and the son, the loss of their own house and the long arc of their sojourn finally land on the domestic scene however temporary. Through most of their lives, privacy has been a luxury. Here, they have the space of their own where they can discuss their private matters in more joyous note. But, alas, it’s only for a brief moment. Among the indoor settings in this film, there are three instances of “upstairs”. Earlier instances are meetings of the father and the son, one in the restaurant (Ryotei) and the other in the lodging in the hot spring resort. Both cases are the borrowed spaces, as if two lovers meet in secrecy. The last appearance of the room upstairs is in this section. The son has a conversation with his father, and goes upstairs to start his carefree day-off. “The room upstairs” has played a symbolic role in Japanese dwelling since late 19th century. “The upstairs” frequently provided a space for a young single male, usually a grownup son, a collage student or an artist-to-be. The following is the analysis by Ai Maeda on the role of two-level structure of a traditional Japanese house in modern Japanese literature. This analysis also applies to the treatment of such structures in Japanese cinema. 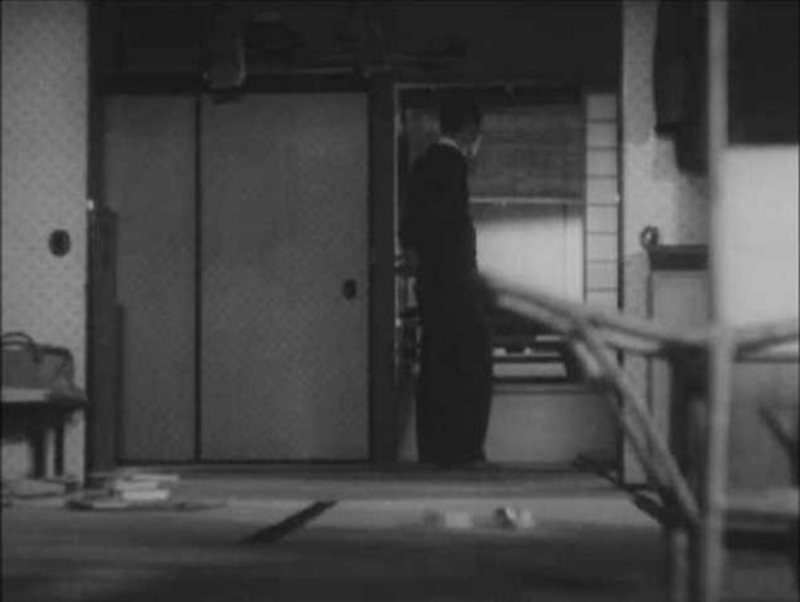 The most evident in Ozu cinema is the early scene in “The Brothers and Sisters of Toda Family”, where we find Shojiro in his room upstairs. Whole family is getting ready for the photo session in the garden, but Shojiro is in his room as if he is oblivious of the family gathering. But the truth is, he knows the session is getting ready, he is aware of being late. The very fact he is not apologetic nor surprised tells us silent admission of his knowledge. Moreover, though his sister and nephew come up to hurry him up, he takes time to change his clothes leisurely. When his nephew tells him the old man is getting angry, Shojiro takes it half seriously, “Don’t make me sweat”. This exchange reveals his handling of delicate balance between accepted indulgence and eyebrow-raising laziness. He cannot be free from his family downstairs, but he indulges himself in this little space, enjoying reclusiveness. Inversely, Shinichiro, the eldest son and the downstairs-dweller, is fully aware of his responsibility and power as an adult male in the family and dutifully exercise them. Another example is Noriko’s room upstairs in “Late Spring”. This is her private, emotional sanctum. Here, she entertains her friend, can express her negative feelings and retreats back into her black hole when she wants to. This place is only allowed for a unmarried woman, as she leaves the place behind on the morning of her wedding. It is probably very fascinating to note that smaller children, pre-schoolers and elementary school students, have their space downstairs with their parents(I Was Born But,…, Tokyo Story, Ohayo, etc.). Back to “There Was A Father”. I found it very peculiar to see the son in the room upstairs. Significance is that this is the first time the adult Ryouhei has his own space and privacy. It is only temporary, since he will have to go back to his teaching in a few days, but his room “upstairs” is finally here. The relationship to his father/downstairs is straightforward as we can easily imagine Ryouhei will come down immediately when “downstairs” calls for him. Shojiro in “Toda Family” has much more “matured” relationship to his downstairs. It is a complex compound of acceptance, dependence, reluctance, indulgence, irritation and comfort and many more, feelings and attitudes of parents and sons who have spent their time together for a long time. Shojiro has everything Ryouhei longed for and much more. But “upstairs”? How do we know it is upstairs? There is no indication of the staircase, as in the cases of Toda Family and Late Spring. Not even the sound of footsteps when the maid comes up to call Ryouhei for help. The only indication is the window in the room, which has railings typically found in second-level rooms. It can be the ground-level room, belonging to the world of “downstairs”. The staircases in Toda Family and Late Spring create the distance, the tunnel through which the downstairs dwellers have to go to reach the privacy of Shojiro or Noriko. Ryouhei in “There Was A Father” does not have this tunnel. Ryouhei’s relationship with the father just ended before it even started.